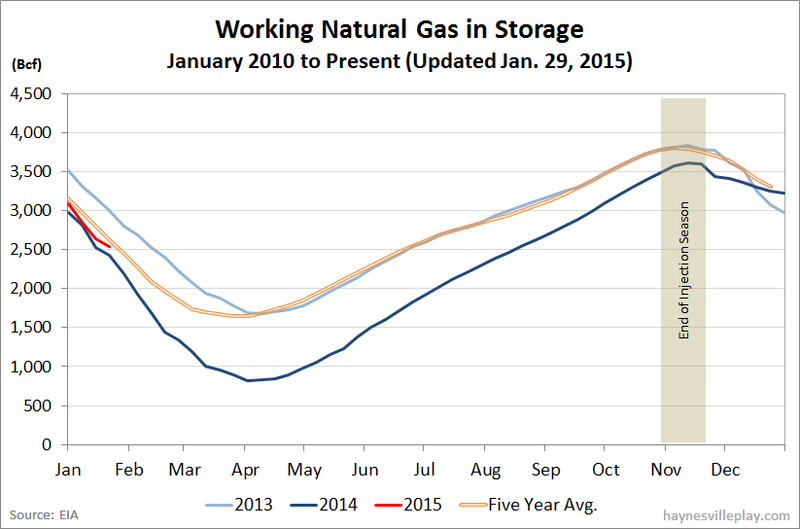 The EIA announced this morning that working gas in storage was down 94 Bcf to 2.543 Tcf last week, which was a warm one. The weekly withdrawal was 57% below last year (-219 Bcf) and 44% below the five year average (-168 Bcf). The current storage level is now 14.6% above last year (2.219 Tcf, a difference of 324 Bcf) and 3.0% below the five year average (2.622 Tcf, a difference of 79 Bcf). Temperatures last week in the Lower 48 averaged 38.9 degrees, which was 5.3 degrees warmer than last year and 5.7 degrees warmer than average.